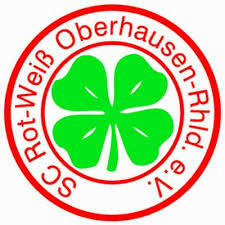 Rot-Weiß Oberhausen is a professional football club from the city of Oberhausen in Germany’s North Rhine-Westphalia. The clubs’ full title is Sport-Club Rot-Weiß Oberhausen e.V. after initially being formed as Oberhausener SV in on the 18th December 1904 following mergers involving Emschertaler SV and Oberhausener TV 1873. A further merger took place with Viktoria Styrum BV to form SpVgg 1904 Oberhausen-Styrum in January 1923. In June 1933, the club finally took the current name SC Rot-Weiß Oberhausen. The club competed in regional football before winning promotion to Gauliga Niederrhein, one of sixteen top flight divisions inaugurated under the reign of the Third Reich. The club managed a couple of third place finishes, before merging with Alstader SV Elmar 09 and Viktoria Oberhausen to form Kriegssportgemeinschaft (KSG) Oberhausen in the 1943-44 season. Returning to the Rot-Weiß (red-white) title, the club won their first honour in 1945-46, when they were crowned as champions of the Bezirk Niederrhein; Lower Rhine, following a 2-0 victory over VfL Benrath. In 1946-47 Rot-Weiß Oberhausen lifted the Bezirksliga Rechter Niederrhein title, before reaching the semi-final of the British Occupied Zone (Meisterschaft in der Britischen Besatzungszone) before bowing out to Hamburger SV. The fine performances meant that ‘Die Kleeblätter’ became members of Oberliga West, which was one of five top flight divisions in post war Germany. Oberhausen were relegated at the end of the 1950-51 campaign to 2. Liga West. In 1956-57 the club climbed back its Oberliga position from where it achieved a fourth and then a third place finish. The newly formed Bundesliga began in the 1963-64 position, but Rot-Weiß’s performances did not warrant a place. Instead they competed in the second tier Regionalliga West, where they continued until the 1968-69 season when under head coach Adi Preißler, Oberhausen achieved promotion to the Bundesliga as Regionalliga West champions. In the 1970-71 campaign coach Günter Brocker was involved in a match fixing scandal that rocked the Bundesliga and was banned from the game. Rot-Weiß were relegated at the end of the 1972-73 season. RWO narrowly missed promotion at the first attempt as they finished as runners-up in Regionalliga West. A new 2. Bundesliga was introduced in 1974-75, with Oberhausen being relegated from 2. Bundesliga Nord to the third level Oberliga Westfalen. In 1978-79 Oberhausen won the Oberliga Nordrhein title and promotion back to 2. Bundesliga. In the same season the team reached the last eight of the DFB Pokal where they were defeated by Eintracht Frankfurt. However, relegation came once again in 1980-81, before RWO won Oberliga Nordrhein again in 1982-83 to return to the second tier. Financial problems hit the club in 1988 as Rot-Weiß Oberhausen had their license withdrawn. The club were automatically relegated to the Oberliga. RWO finished bottom of Oberliga Nordrhein in 1988-89, going down to Verbandsliga Niederrhein from where they rebuilt and recovered before winning the league title in 1992-93. The fightback continued as Oberhausen were champions of Oberliga Nordrhein in 1994-95. Following the re-organisation of German football, this meant that RWO joined the third tier Regionalliga West/Südwest, where they went on to be crowned champions in 1997-98 to return to 2. Bundesliga. Aleksandar Ristić took RWO to the semi-final of the DFB Pokal in 1998-98, with the ‘home’ tie being moved to the Parkstadion in Gelsenkirchen. Rot-Weiß bowed out 3-1 to FC Bayern München. The goals of Achim Weber played a big part of the team’s success. Angelo Vier found the net frequently as RWO kept their second level status. Jørn Andersen became coach in 2003 before he was dismissed. Eugen Hach took charge of the team as the team were relegated to Regionalliga Nord in 2004-05. The new coach was Harry Pleß, who struggled with off the field issues leading to the board of directors resigning. Pleß moved on in May 2006 with Günter Abel stepping up from the reserve team. The new coach could not avoid RWO slipping back down to the fourth tier Oberliga Nordrhein. Hans-Günter Bruns arrived as the new coach as a new board was appointed with the team taking the Oberliga Nordrhein title on the final day of the 2006-07 season. A runners-up finish in Regionalliga Nord in 2007-08 saw RWO return to 2. Bundesliga as Jürgen Luginger came in as the new head coach. Bruns returned to look after the team in February 2010 before he was dismissed and replaced by Theo Schneider a year later. The new boss could not save Rot-Weiß from relegation to the newly formed 3. Liga for the 2011-12 campaign with former German international Mario Basler in charge of team affairs. Despite his experience, RWO were demoted once again to Regionalliga West. The club continued at the fourth level as head coaches came and went. Basler was replaced by Peter Kunkel, who lasted a couple of years before Andreas Zimmermann came in. Zimmermann’s reign lasted until 2016, when former youth team boss Mike Terranova was appointed in his place. Rot-Weiß Oberhausen ended the 2016-17 season towards the top end of the table. Rot-Weiß Oberhausen will play in Regionalliga West in the 2017-18 season. My visit to Oberhausen was initially one of necessity rather than choice, but it all turned out well in the end. My main match was between Fortuna Düsseldorf and Arminia Bielefeld on the Friday evening. However, Düsseldorf was staging a large trade fair over the weekend, meaning that accommodation prices had gone through the roof. After much research I found a room in Oberhausen at the City Lounge Hotel. Friday evening’s libations were spent in Düsseldorf’s Aldstadt as Oberhausen didn’t really offer anything too attractive. It wasn’t too dissimilar to a downtrodden northern English town of the 1980’s. It even had a Woolworth’s. Earlier on the Saturday morning I took a train to take a look at Stadion Essen, the home of neighbours Rot Weiss Essen, before returning and taking a football special bus from outside the railway station for the ten minute ride to Niederrheinstadion. I paid €9 for a standing place on the Emscherkurve before heading onto the open concourse behind the stand where I purchased a bratwurst and a beer before heading up to the back of the terracing. No programmes were issued. Niederrheinstadion was an old fashioned arena with an athletics track around the pitch. Both curves had open terracing, with the far end having an aging scoreboard at the rear. Both sides had covered seating, with the side opposite the main facilities having an additional block of terracing under the roof. The local ultras were under the roof and doing their best to build up the atmosphere. The fifty or so visiting fans were directly opposite to cheer on their top of the table side. The locals did their best to get behind their side, but in truth the team were a bit huff and puff. The visitors went ahead in a scrappy first half in which they looked the better organised outfit as Sven Kreyer capitalised on some poor defending just before the half hour mark. At the interval, I followed some of the crowd over the road to what I thought was a clubhouse, but it turned out to be for sponsors only. A kind steward gave me access to the rear of the Main Stand to take some additional photos. The second half followed a similar pattern to the first. Oberhausen didn’t offer too many threats to the competent Koln defence. Their task wasn’t helped when forward Simon Engelmann received his second yellow card from referee Dominik Jolk and was sent for an early bath with ten minutes remaining. To add to the frustration of the home fans Koln made it 2-0 just two minutes later when Dominik Lanius netted. I gave it a few more minutes before heading down the steps and ensuring my place on the first bus back to the station. Oberhausen’s limited supply of bars didn’t do anything to tempt me in, so I decided to head back to Dusseldorf Airport in good time, rather than rushing. As things turned out I had far too long awaiting to board my flight back to Heathrow.